I have a confession to make. I dislike someone—the ice cream truck man. His music is annoying, but that makes me pity him because it must be torture to listen to that all day long. What I dislike is that he ruins my perfectly content moment by giving me a desire for something I don’t need. How about you, are you a contented person (or do you want some ice cream right now)? Test yourself. Are you satisfied with yourself and with your life? Are you content with your job? Are you happy with your income? Do you feel that you are paid what you’re worth? Phil. 4:11-13 I am not saying this because I am in need, for I have learned to be content whatever the circumstances. I know what it is to be in need, and I know what it is to have plenty. I have learned the secret of being content in any and every situation, whether well fed or hungry, whether living in plenty or in want. I can do everything through him who gives me strength. So let me ask the question: “What is contentment?” It is not apathy. It is not being melancholy. It is not a spirit of laziness or adapting an attitude of complacency. Contentment is taking a realistic view of your situation and adjusting to it without anxiety. Contentment is independent from circumstances. Its power comes from relying on God no matter what situation we find ourselves. Paul says the secret of contentment is learned. It’s not something that is instantaneous. The situations of life are where we learn contentment. The problem is – many people turn bitter instead of better when they face difficulties. Some people never learn how to be content and they live life unfulfilled, unsatisfied, and unhappy. So, what are the enemies of contentment? Another enemy of contentment is “Unfair comparisons.” When we compare ourselves to others, we are sure to find someone else more attractive, someone more gifted and talented, or someone younger and stronger. And we will always be discontented if we compare ourselves to others, for one of two things will happen: 1. We become prideful – because we see ourselves better than others. 2. We become jealous – because we don’t have what others have. A third enemy of contentment is “Unnoticed blessings.” We live in the most affluent nation in the world. We have more possessions, more freedoms, and more opportunities than almost anyone else. Still, we’re among the most discontented people on earth. One problem is that we don’t usually notice our blessings. We take so much for granted. For example, is air-conditioning a necessity or a luxury? “Well,” you say, “it’s a necessity for me.” But 50 years ago people lived in Arkansas in the summer and they coped. This church was built without air-conditioning, still, people came to worship. You see, air-conditioning is one of those things that most of us just take for granted. We expect our homes and our church building to be delightfully comfortable. The only time we even notice it is when it breaks down and we have to sweat a bit. What about an automobile – is it a luxury or a necessity? What about television, cell phones, computers? There was a time when we were content without these things, but then the “ice cream man” shows up, producing in us a desire for the latest and greatest gadget? The old one is not good enough anymore. It no longer satisfies us. 1Timothy 6:6-10 But godliness with contentment is great gain. For we brought nothing into the world, and we can take nothing out of it. But if we have food and clothing, we will be content with that. People who want to get rich fall into temptation and a trap and into many foolish and harmful desires that plunge men into ruin and destruction. For the love of money is a root of all kinds of evil. Some people, eager for money, have wandered from the faith and pierced themselves with many griefs. Today we have a lot more than food and clothing. But still very few are content. We have many “Unnoticed blessings” that we take for granted. We should wake up, take notice, and repent. Another enemy of contentment is “Uncontrolled ambition.” Now the Bible does not condemn ambition. It encourages us to be ambitious and to strive for excellence in the faith. However, when ambition is uncontrolled, selfish, or simply fuels our ego, it is sin. James 3:13-16 Who is wise and understanding among you? Let him show it by his good life, by deeds done in the humility that comes from wisdom. But if you harbor bitter envy and selfish ambition in your hearts, do not boast about it or deny the truth. Such "wisdom" does not come down from heaven but is earthly, unspiritual, of the devil. For where you have envy and selfish ambition, there you find disorder and every evil practice. Now, let’s look at the secret of being content that Paul learned. The secret of contentment is not a principle, but a person—Jesus Christ. By His grace, believers are empowered by the Holy Spirit to be content no matter the circumstances. If our eyes are fixed upon Jesus and what He’s doing in this world, then we will agree with the songwriter: “You can have all this world; give me Jesus.” If our eyes are not fixed on Jesus, we will experience discontentment. 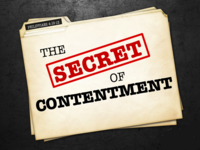 Contentment is not acquired by some holy “zap.” Paul learned the secret of being content through the things that happened in his daily life and the presence of the Holy Spirit sustaining him in everything. Therefore, Paul could write, Rom.8:28 And we know that in all things God works for the good of those who love him, who have been called according to his purpose. Through everything Paul endured and everywhere he went, God taught him things about the secret of being content. Paul often experienced what it was like “to be hungry,” and “to suffer need.” Paul learned to experience contentment, even in the loss of all things, because he had learned to rely upon the One who is everything and the source of his supply and contentment: Jesus Christ. The world promises to give us contentment through more possessions. God promises to give us contentment through decreased desires. More accurately, God will produce contentment in us by giving us a single desire—the desire for Jesus, who is all we need. Paul learned that when he had everything, it didn’t add anything to him, because it paled in value when compared to Jesus. When Paul had nothing, he learned that it didn’t take anything from him, because Jesus was everything to him. In other words, Paul is saying, “As long as I’m in Christ and He is in me, I am content with whatever circumstances come upon me.” Likewise, contentment comes to us when we focus on Christ and trust Him for the power to prevail over circumstances. We can do nothing apart from Christ, except sin. On the other hand, we can do everything through Christ who gives us strength. One of those “everythings” is finding contentment in all situations. Whether we are experiencing plenty or want in our life right now, the secret to being content is Jesus. It is HIS grace that provides the contentment we need when we have plenty. It is HIS power that gives us hope and contentment even when the cupboards are bare and the bills are overdue. When we are spending time on a regular basis praying to Jesus, studying God’s word, and surrendering our life to the power of the Holy Spirit, we find that no matter what else is going on in our life, we feel content. Why is that? Because when we are living our life for Jesus Christ, we begin to understand that nothing happens to our life without His knowledge. Nothing that happens, either good or bad, can take us away from God’s love. It was because of this connection to Jesus Christ, and the power of the Holy Spirit, that Paul was also able to say with contentment, Phil 1:21 For to me, to live is Christ and to die is gain. Contentment comes when everything in our life pales in comparison to knowing Christ Jesus. When this is true in our life, suddenly having the best material things and the need to receive everything we desire in life become less important to us. If we rely upon the power of the Holy Spirit, we find that our daily circumstances will have less and less control over our state of mind, and contentment will begin to be the norm of our life. I want you to hear the words of the Apostle Paul, written from house arrest, while chained to a soldier, and awaiting a trial that could end with his execution. Phil 4:19 And my God will meet all your needs according to his glorious riches in Christ Jesus. To another church, he wrote: 2Cor. 9:8 And God is able to make all grace abound to you, so that in all things at all times, having all that you need, you will abound in every good work. In summary, there will always be people that make more money than us. There will always be people who are smarter than us. There will always be people who are better looking than us. So what? These comparisons have no bearing at all on our own personal contentment. Besides, everything in life changes. Nothing stays the same except Jesus Christ, who is same yesterday and today and forever (Heb 13:8). If nothing else is changing in your life right now, you are at least getting older. Are you content with that change? I dislike getting older; I don’t like seeing other people get older. However, I can do nothing about it, and if I focus on aging, it makes me discontent. Therefore, I must learn to take my eyes off of self and focus on Jesus, who is my life and source of contentment. Contentment is not based on our situations of life, but on our relationship with Jesus Christ. The closer we get to Jesus, the more contentment we experience. Instead of depending on our own strength and effort, we learn to draw on Christ’s power just like Paul learned to rely on His power. God, the Holy Spirit, has more power than we can even imagine – and He wants to strengthen us. Paul did not sit around and mope while in prison – he had learned how to cope in every situation. He had learned to be content with Jesus. Therefore, his letters were inspired by the Holy Spirit and encouraged those not in prison, just as they continue to encourage us today. The reason that people are unhappy, unsatisfied, and unfulfilled is because Jesus Christ is not the center of their lives. They are looking for contentment in all the wrong places. They are not seeking contentment in God’s kingdom and His righteousness. Matthew 6:31-34 So do not worry, saying, 'What shall we eat?' or 'What shall we drink?' or 'What shall we wear?' For the pagans run after all these things, and your heavenly Father knows that you need them. But seek first his kingdom and his righteousness, and all these things will be given to you as well. Therefore do not worry about tomorrow, for tomorrow will worry about itself. Each day has enough trouble of its own. We were made for a purpose and that is to have a relationship with God through Jesus Christ. When we try to find satisfaction in life through people, popularity, possessions, or prestige – we will never be content – we will never be satisfied. Jesus said John 10:10 The thief comes only to steal and kill and destroy; I have come that they may have life, and have it to the full. A contented life comes from having a relationship with Jesus and learning to trust Him. How about you? Are you content? If you are not, then learn the secret of contentment from the apostle Paul, accepting Jesus as your Savior, making Him the Lord of your life.